This event is for members of the Golden Chamber of Commerce only and their guests. Stop in for a quick hello and a refreshment right after work and a chance to get to know fellow members of the Golden Chamber of Commerce. This is a great networking and socializing event. Each month we will visit a different member business. Mountain Side Gear Rental is our November host! 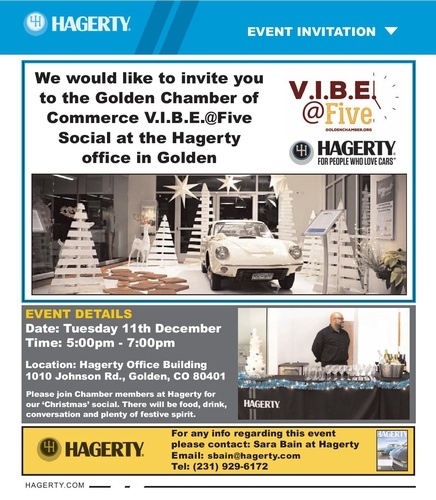 VIBE@FIVE will take place on the 2nd Tuesday of each month from 5:00 - 6:30 p.m.. This event is included as part of your Chamber membership. Members will receive free appetizers at this event. You are welcome to purchase drinks if you chose.